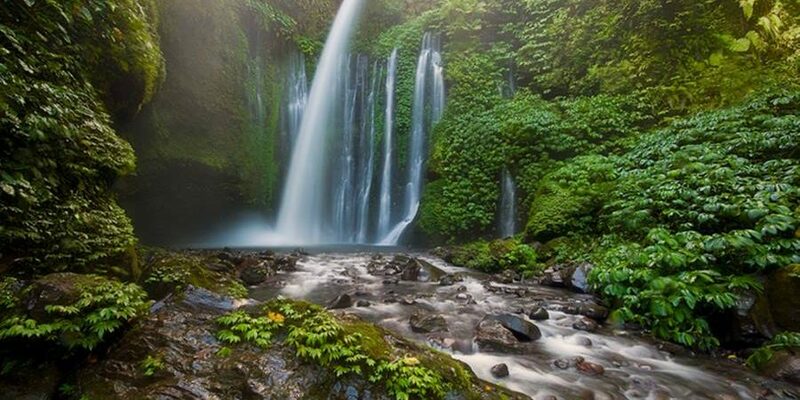 You will find all these natural waterfalls at the end of the climb Rinjani mountain adjacent to Senaru village. After trekking mount Rinjani visit to Sindang Gila waterfall and Tiu Kelep waterfalls, two waterfalls is located in Senaru Village, the area of the National Park of Mount Rinjani. The second waterfall location adjacent to each other. Every day especially on weekends many tourists who visit these attractions. From the ticket sales counter, visitors must enter on foot down the hundreds of stairs to visit the waterfall Sindang Gila. The origin of the name Sindang Gila i.e. when there is a lion or crazy in the local language is called Sindang Gila create disorders in villages. The citizens of rollicking chasing Lions until into the Woods until they finally found the waterfall. At first glance these two-storey waterfall. However, if we observe carefully, gust indirect water plunging down but rather a bit is stuck on a cliff that is somewhat indented like forming a pool of temporary shelter. The tourists are usually directly in the body itself so felt a gust of fresh water from the waterfall at its source Lake Segara Anak of Mount Rinjani. Not far from the waterfall Sindang Gila, there is a waterfall that is not less beautiful Waterfall, IE: Tiu Kelep. How to Get Mount Rinjani in Lombok? What You Should To Bring Climb Rinjani? Copyright 2018 Rinjani Eco Green. All Right Reserved.